Sure, it took an enormous fluke, but the schizophrenic Steelers topped the previously unbeaten Chiefs and are right back in the thick of the AFC chase. They’re there without much success from No. 2 receiver Martavis Bryant, and his frustrations have reached the point where he’s requested a trade. NFL Network first reported Bryant’s trade request, while ESPN adds that the request was made weeks ago. 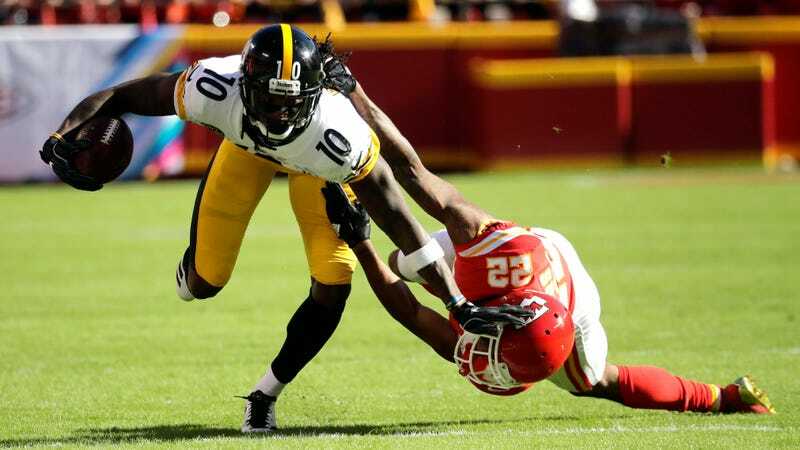 Bryant is unhappy with his role in the offense; he’s fourth on the team in receptions and third in targets, and is increasingly losing catches and snaps to rookie WR JuJu Smith-Schuster. Bryant is still on his rookie deal through next season, which would actually be his fifth season with Pittsburgh; he missed all of 2016 after being suspended by the league for smoking weed. The Steelers reportedly claim not to be interested in trading Bryant, but if they change their minds, the deadline is Oct. 31.